One piece tent with two sectional poles and all stakes and guy ropes shown in photographs. Tent has ventilation at each end and along side walls (velcro cover inside). Zip door openings at each end. 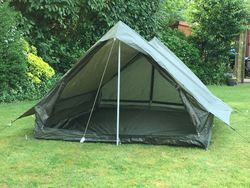 Built in waterproof groundsheet is strong and plastic coated on outer surface for damp proofing. Easy to erect and packs away into supply bag. Size: 2m x 1.6m x 1.2m tall. Brand new un-issued condition, direct from French war reserve stocks.